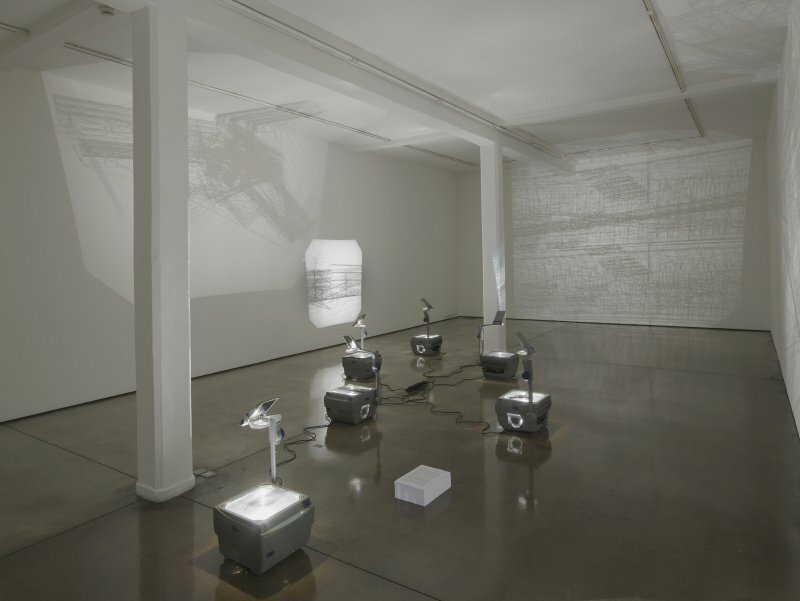 Exhibition view of Lawrence Abu Hamdan’s Earwitness Theatre at Chisenhale Gallery, London, 2018. Photos: Andy Keate. Courtesy Chisenhale Gallery, London and Maureen Paley, London. Lawrence Abu Hamdan, Saydnaya (ray traces), 2017. 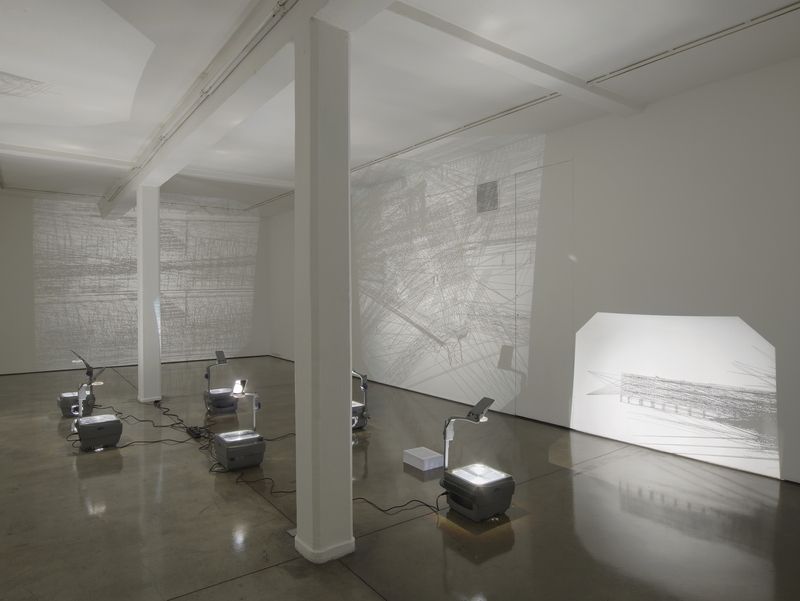 Inkjet prints on acetate sheets on overhead projectors exhibition view, Maureen Paley, London, 2017 © Lawrence Abu Hamdan, courtesy Maureen Paley, London. On the occasion of Para Site’s recent International Conference entitled ‘What to let go?’ Filmmaker, artist and self-proclaimed ‘private ear,’ Lawrence Abu Hamdan gives us a glimpse into what comprises his intricate and profound practice while underscoring the significant relationship that transpires between objects, memories, and sounds. Images: Courtesy of Artist and Maureen Paley, London. Ear witness testimonies are crucial, often determining factors, in verdicts of legal cases. OJ Simpson, Trayvon Martin, Michael Brown and Oscar Pistorius are amongst the more high profile murder trials in which they were used. Abu Hamdan cites these examples, acutely observing that “in each of these cases, the perpetrator, murderers of Michale Brown and Trayvon Martin got off scot-free, when sound was at stake and was being discussed.” He further identifies “the lack of ability to speak about sound,” as a hindrance, particularly in legal contexts, to achieving justice and uncovering the truth. Having made a career out of examining audio evidence, often in cases relating to human rights violations, Abu Hamdan used his work, Saydnaya, as a point of departure to reveal the transition made in his process of designing ear witness interviews. In collaboration with the Turner prize nominated, acclaimed independent research agency Forensic Architecture, he launched an investigation (commissioned by Amnesty International) into the infamous Syrian torture prison – Saydnaya. While the geographical location of this prison is known, the internal ongoings remain a mystery. Considered a journalistic black spot, it has been estimated that approximately 17,000 people have been killed there since 2011. Prisoners are bought in blindfolded, kept in the dark, and can only relay what they hear around them, all of which are crucial factors in building a case against war crimes. Abu Hamdan was able to interview former prisoners, for whom he played his sound effects in order to recreate aspects of the prison and experiences of the detainees. For instance, by producing the sound of an ‘aluminium step ladder,’ he was able to establish the existence of a metallic staircase leading to a guard’s room. Witnesses never saw this staircase, but knew of its existence due to the metallic clanging sound made by guards climbing up and down on a daily basis. This was further used to determine the relative locations of prisoner’s cells. Through a laborious process of constructing a sequence of sounds produced by objects (in this case ‘footsteps, metal, male, sneakers, upstairs), he closely collaborated with the witness, constantly altering volume and tempo in an experiment of sorts to match their experience. This successfully resulted in a definitive direction – northwest – as seen on the sonic compass, unlocking a fixed location from which he could have heard other sounds in the prison. Other aspects of the detainee’s experience were uncovered through Abu Hamdan’s persistent experimentation. Inadvertently measuring the intensity of hunger, the sound of a metal door slamming in a space as vast as the Notre Dame Cathedral, was surprisingly equated with the sound of a packet of Arabic bread being dropped on the floor. After the interview the artist conducted his own experiment dropping sheets of bread to the ground, concluding that no amount of bread, which would be given to prisoners, would be large enough to make the same sound. What it did reveal was, “the way in which starvation distorts the senses.” Similarly, the use of silence as punishment in the prison altered perception. It was enforced to the extent that prisoners were prohibited from coughing or even scratching an itch. A prisoner conveyed the impact of silence to him by citing the killing of lice as one of the loudest sounds heard in the prison, which ordinarily is akin to crushing a sesame seed between one’s fingers. Through this project, Abu Hamdan realized that by employing the same methods used by sound effects artists (who create sounds for films to imitate ones made in real life) his work could be viewed as a means, “not to produce illusion and to imitate space, but also as a mode of truth production, actually to uncover and reenact events and solicit ear witness testimony.” Discovering the myriad of ways in which sound manifests itself in the human experience, specifically memory, is at the core of Abu Hamdan’s practice. One which he seeks to explore through examining and unearthing the relationship and unconsidered links between sound, memory, and object. The visualization of his research and practice re-affirms this. The result of his interviews with former Saydnaya prisoners take form as cast images, projecting an architectural rendering of the prison through ray tracing – a digital tool used to map acoustic leakage of a given structure. Also born out of this harrowing project, is one of the artist’s most recent works, Ear Witness Theatre, which was exhibited at Chisenhale Gallery London. 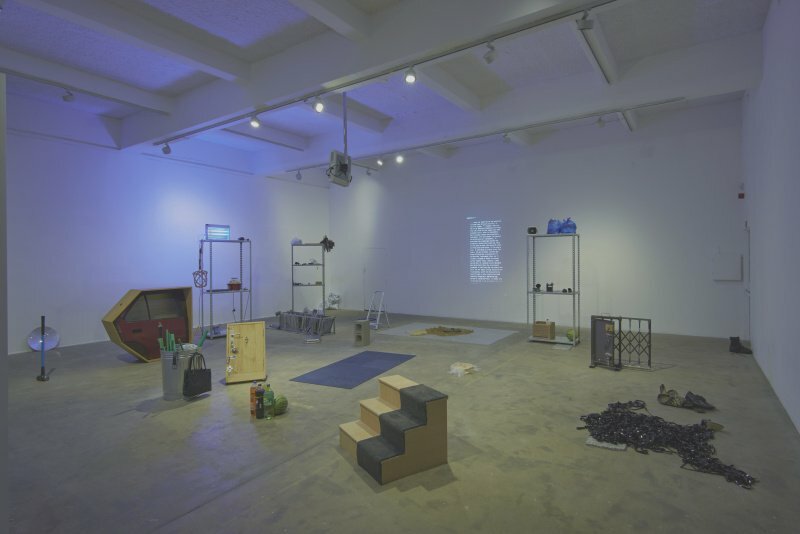 Featuring yet another seemingly random assortment of objects such as a popcorn machine, metal trays, a packet of Cudor’s Arabic bread scattered across the gallery, Ear Witness Theatre forms a narrative with objects sourced from a global selection of trial transcripts in which they were described in ear witness testimonies. 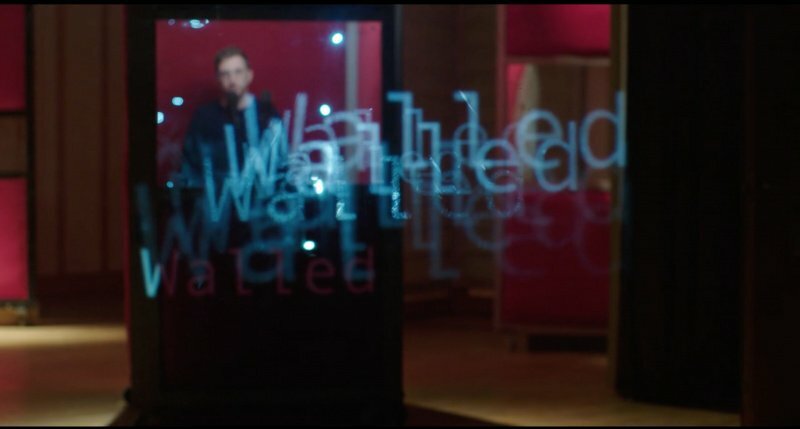 Revealing yet another method by which ear witness testimonies are solicited, Wall Unwalled (2018), a performance video installation, consists of monologues and reenactments based upon evidence from legal cases that were gathered and heard through walls. 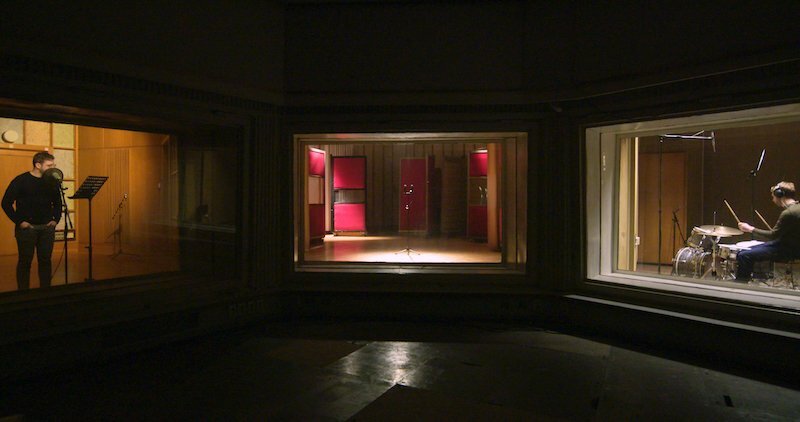 Filmed inside the Funkhaus Berlin, the former recording studios of the GDR’s radio broadcasting center, the video features projected images and use of moveable walls unique to the space, substantiating the artist’s analysis of how walls as barriers are at times unsuccessful in inhibiting the flow of communication, particularly through aural channels. In addressing ‘what to let go?’, the prime question raised during Para Site’s International Conference in the context of an art historical and political discourse, the answer by way of Abu Hamdan’s practice seems to be our perceptive dependency on sight, or inclination towards assessing a situation with pre-informed biases. That which is based upon what we already know, not inquiring beyond. As Hamdan notes, “there is a lack of vocabulary in speaking about sound.” We are so reliant on sight as a confirming authority, that describing what we hear becomes inherently more challenging. In fact, artists who work in a political realm are often critiqued for “aestheticizing politics.” In reaction to this Abu Hamdan notes that news (particularly pertinent in today’s politically charged climate) in itself is the “the manipulation of visual representation of information,” and we are inclined to believe what we see. Therefore the significance of his work is amplified because when we approach how we understand circumstances through aural means, we are provided with a method that exposes radically different facets of an event, potentially altering our perception and understanding of it. Abu Hamdan infuses this into a visual arts context. The tangible impact of his work outside the art world context distinguishes his abilities as an artist. However it is the visualisation of this impact which demonstrates the possibilities creative forces contain to affect change. Lawrence Abu Hamdan is an artist and audio investigator. Abu Hamdan’s interest with sound and its intersection with politics originate from his background as a touring musician and facilitator of DIY music. The artists audio investigations has been used as evidence at the UK Asylum and Immigration Tribunal and as advocacy for organisations such as Amnesty International and Defence for Children International. The artist’s forensic audio investigations are conducted as part of his research for Forensic Architecture at Goldsmiths College London where he received his PhD in 2017. Abu Hamdan is the author of the artist book [inaudible] : A politics of listening in 4 acts. Abu Hamdan was the recipient of the 2018 Abraaj group art prize, his film Rubber Coated Steel 2016 won the Tiger short film award at the Rotterdam International Film festival 2017 and his exhibition Earshot at Portikus Frankfurt (2016) won him the 2016 Nam June Paik Award for new media. Abu Hamdan was 2017/2018 guest of the DAAD Kunstler Program in Berlin and the 2015-17 fellow at the Vera List Centre for Art and Politics at the New School in New York. His solo exhibitions include Hammer Museum L.A (2018), Portikus Frankfurt (2016), Kunsthalle St Gallen (2015), Beirut in Cairo (2013), The Showroom, London (2012), Casco, Utrecht (2012). His works are part of collections at MoMA, Guggenheim, Van AbbeMuseum, Centre Pompidou and Tate Modern.